Having just returned from the North American Junior and Young Riders Championships, I can say with confidence that this was a horse show that had it all! There were Quarter Horses and Dutch Warmbloods; there were cowboy hats, hunt caps and top hats. There was sun and sand; there was rain and mud. 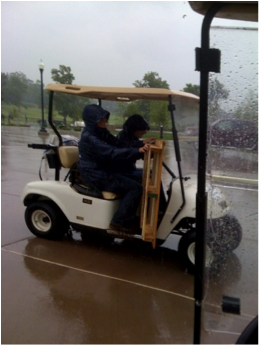 There was even pushing a dead electric golf cart uphill in the rain! Spanning the course of 6 days, the NAJYRC utilized practically every inch of the Kentucky Horse Park – which is no small feat! Of course, there were 4 different championship events (reining, dressage, show jumping and eventing) and two non-champion events (vaulting and endurance), so it’s no wonder it took a facility like the Horse Park to host it all! Only its second year as a championship event, reining sparked a lot of interest from the English side of the competition and drew in quite a few local spectators! As a hunter/jumper rider myself, it was pretty exciting to experience a completely different style of riding and meet some of our customers with Western backgrounds. I still have one question though: how in the world do you not trip over those Western spurs!?! When all was said and done, it was a pretty incredible experience and exciting week at the Horse Park! Congratulations to all the riders, families and horses that participated and thank you for letting us be a part of the experience! SmartPak sponsored the reining component of the competition. Featured in the state-of-the-art indoor ring, this part of the competition was the very first event to happen in the newly built facility, which is currently being prepped for use during the 2010 World Equestrian Games. 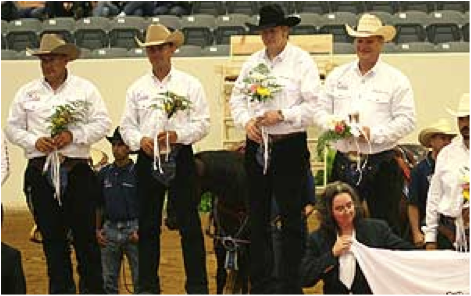 In fact, running along side the NAJYRC was the WEG test event for reining, where the U.S. team, including Team SmartPak rider Tom McCutcheon, took top honors.